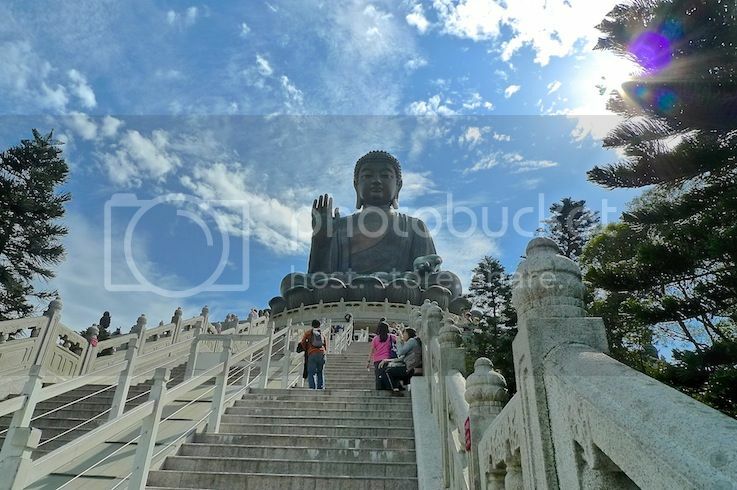 The Tian Tan Buddha (also known as the Big Buddha), is a popular tourist attraction in Hong Kong. 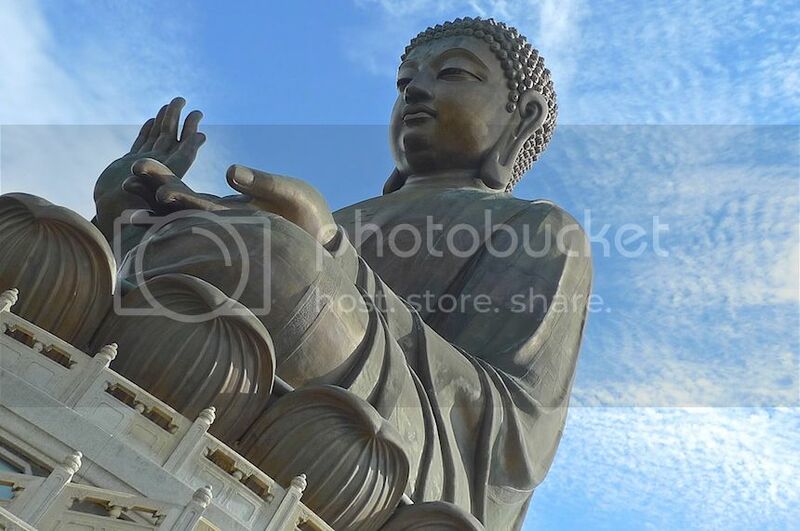 Located next to the Po Lin Monastery at Ngong Ping on Lantau Island, it is one of the world's tallest outdoor sitting bronze Buddha statues in the world. 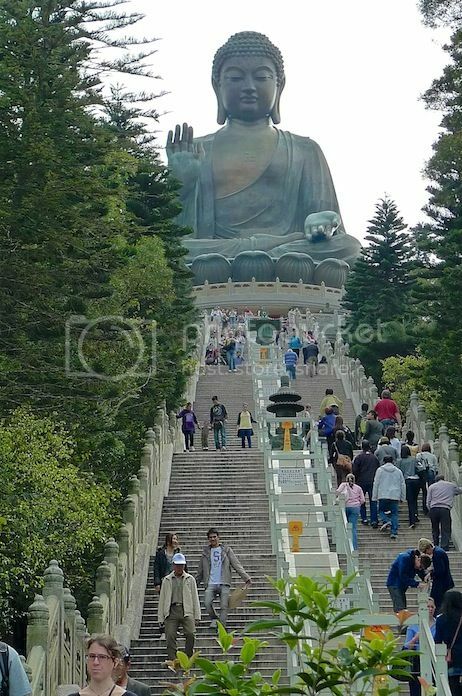 During our fifth day in Hong Kong, my friend and I visited the Big Buddha for the very first time. 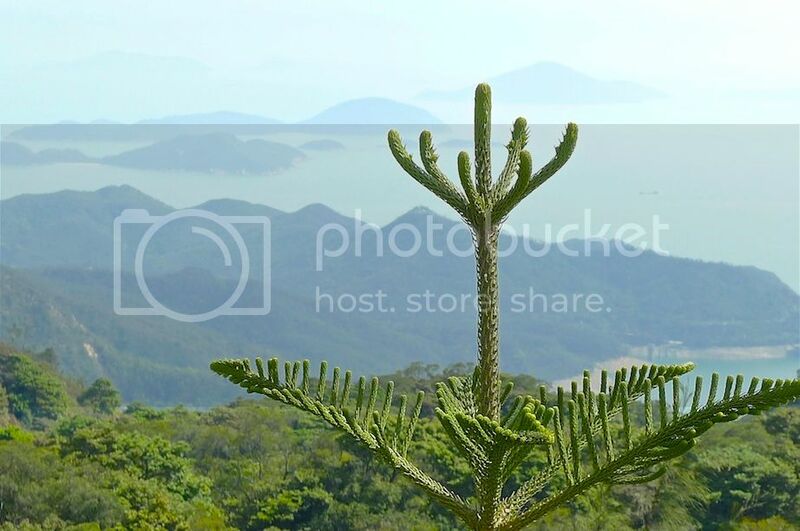 From Mongkok, we took the MTR to Tung Chung where we experienced the awesome cable car ride to Ngong Ping Village. 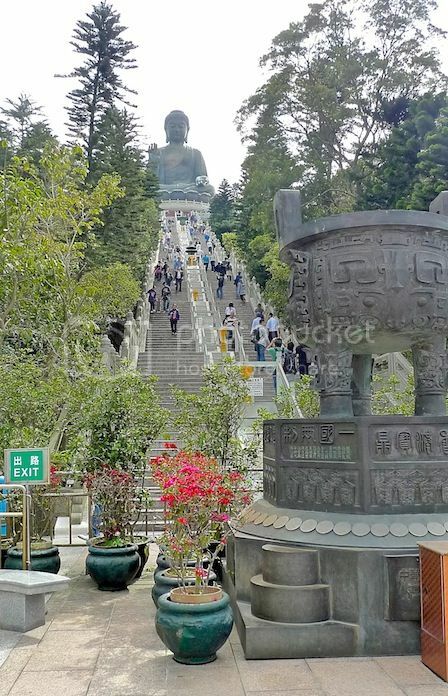 After walking leisurely for half an hour at Ngong Ping Village, we reached the foot of the 268-steps staircase leading up to the Big Buddha. 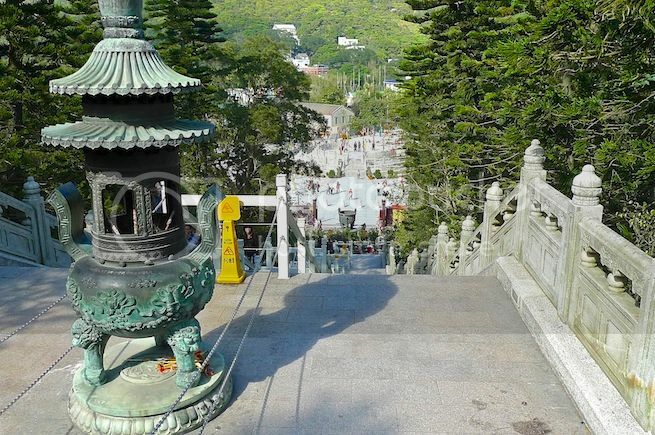 This is the stairs that separated us from the famous Buddha statue. Did we climb up to the top? You bet! Fortunately, the weather was not hot, so it made climbing the stairs easier. In fact, I was quite surprised at how easy it was. I did not even break into a sweat climbing the steps - it was definitely easier than climbing the steep 272 steps of Batu Caves in Malaysia! There were quite a lot of tourists that day but luckily, it was not overcrowded. Halfway up, I snapped this photo below. The Big Buddha looked almost ethereal from here. After climbing for about 15 minutes, we finally reached the top! The 34 meters tall bronze statue looked really awesome! 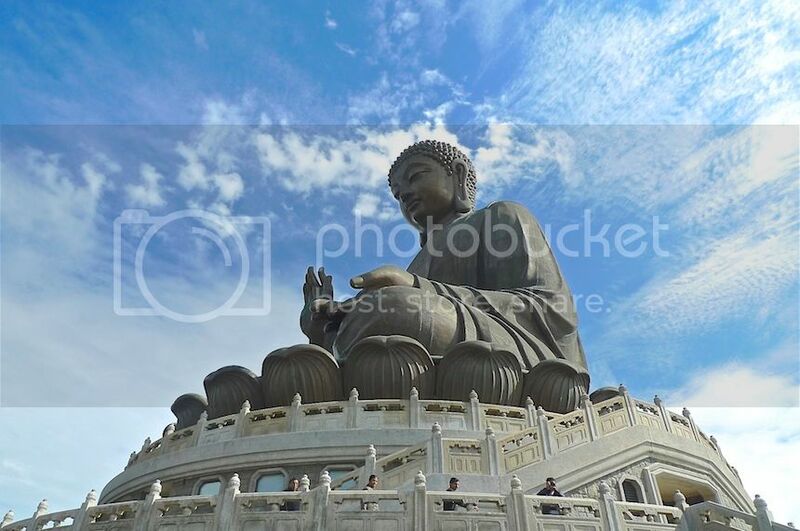 Weighing about 250 tons, the Big Buddha sits on a giant lotus flower on top of a three-platform altar. 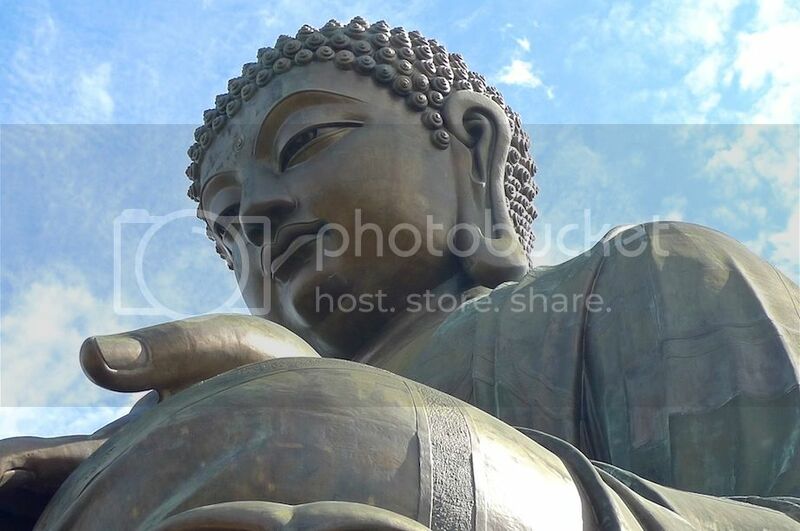 Every feature of the Buddha statue has a symbolic meaning of religious significance. 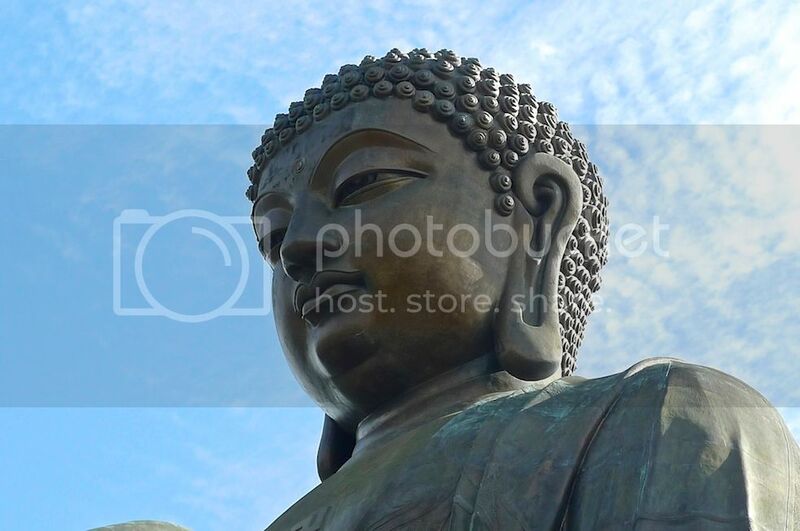 With broad forehead and elongated ears reaching to the shoulders, the Buddha is an embodiment of wisdom and perfection. 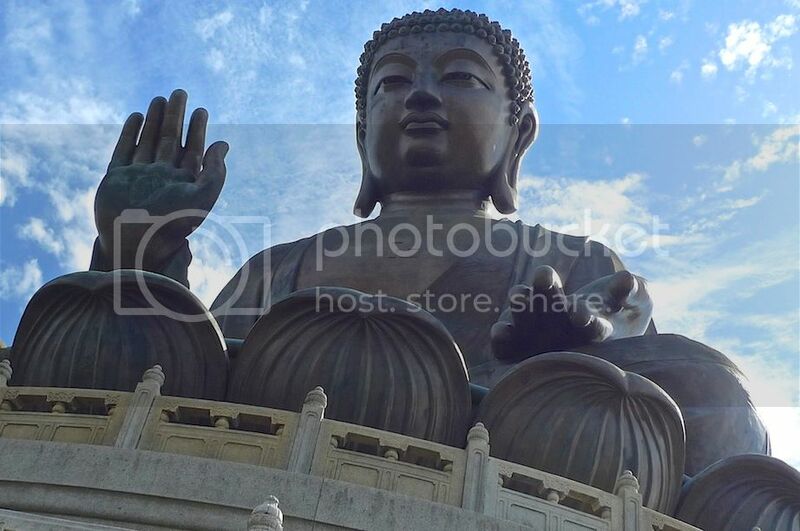 If you are wondering why the Big Buddha is called Tian Tan Buddha, well, that's because its base is a replica of Tian Tan, the Temple of Heaven in Beijing. 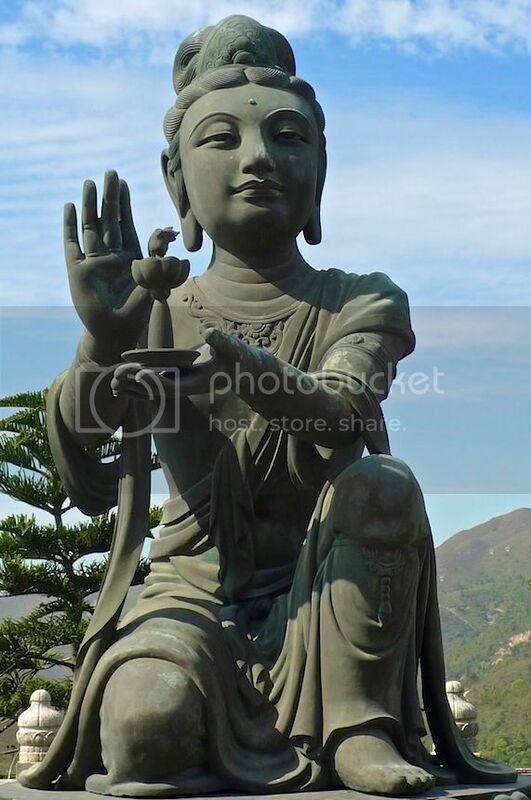 The raised right hand is in the mudra of imparting fearlessness, which represents removal of affliction and sufferings. The left hand which rests on the lap, with the palm faces upwards and fingers pointing slightly downwards is seen as a gesture of giving dhana or generosity in granting blessing and happiness. 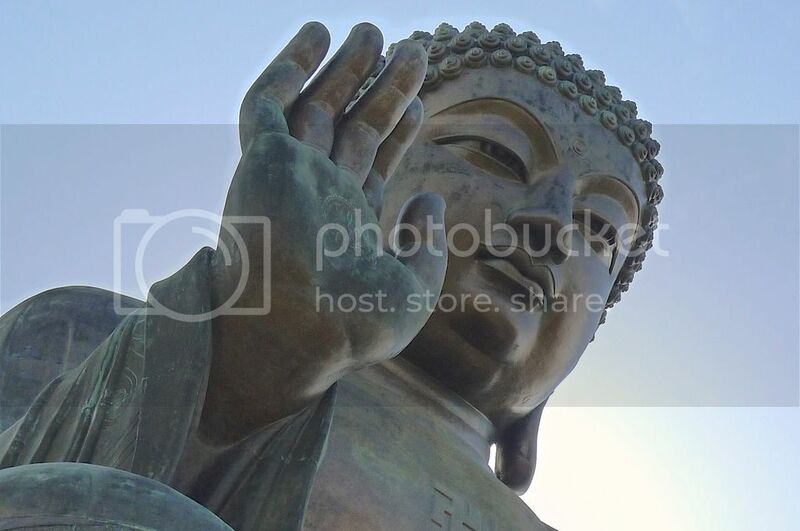 The Big Buddha is surrounded by six smaller bronze statues, three on each side. These statues known as "The Offering Of The Six Devas" are posed offering flowers, incense, lamp, ointment, fruit and music to the Buddha. These offerings symbolize charity, morality, patience, zeal, meditation and wisdom - all the qualities necessary to enter Nirvana. 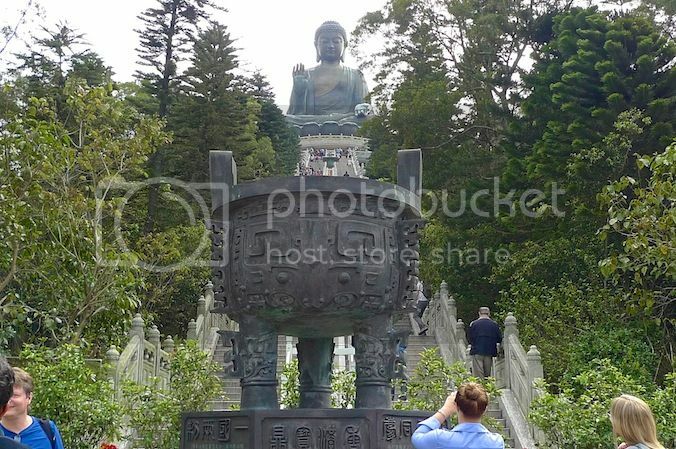 Front view of one of the statues making offerings to the Tian Tan Buddha. There are 3 floors beneath the Buddha statue which are exhibition halls - the Hall of Universe, the Hall of Benevolent Merit and the Hall of Remembrance. The third floor houses the relic of Gautama Buddha, including some of his alleged cremated remains. Access to the Big Buddha statue is free, but to enter the three floors of Exhibition halls, a fee of HK$25 (US$3.20 / RM10.65) is charged. Also, no photography is allowed inside so I could not show you any photos. Alternatively, you can purchase a simple vegetarian lunch for HK$60 (US$7.70 / RM25.55) or a deluxe vegetarian meal for HK$100 (US$12.90 / RM42.60) - both of which entitles you free entry into the Exhibition halls. My friend and I bought the HK$100 vegetarian lunch, which I shall blog about in the next post. 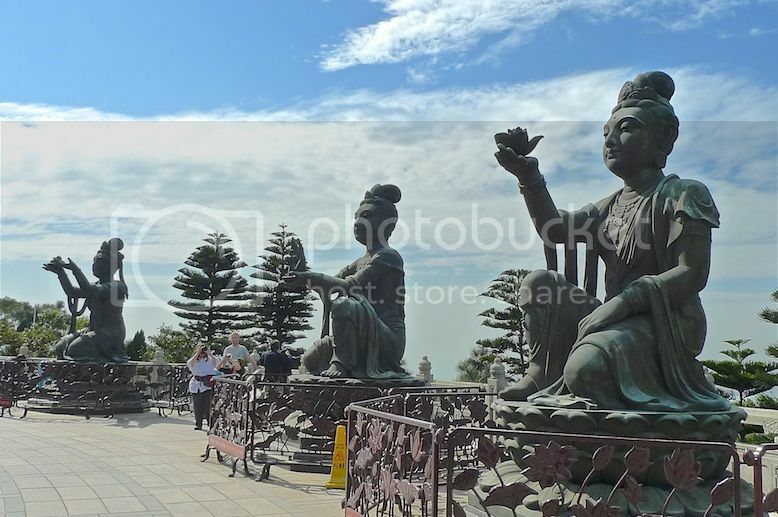 It is said that on a clear day, the Big Buddha can be seen from as far as Macau. Standing up here, I could see the view of the surroundings which was serene and beautiful. 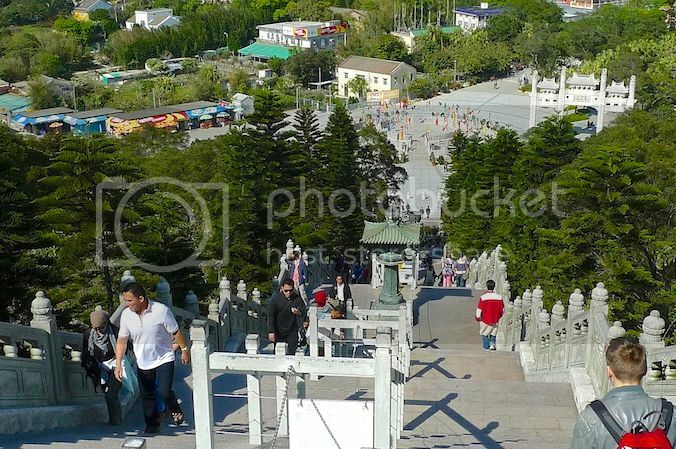 Soon, it was time to leave the Big Buddha and descend the stairs. The view from the stairs looking down was pretty awesome. My stomach was rumbling as it was way past lunch. I could not wait to eat the vegetarian lunch at Po Lin Monastery. 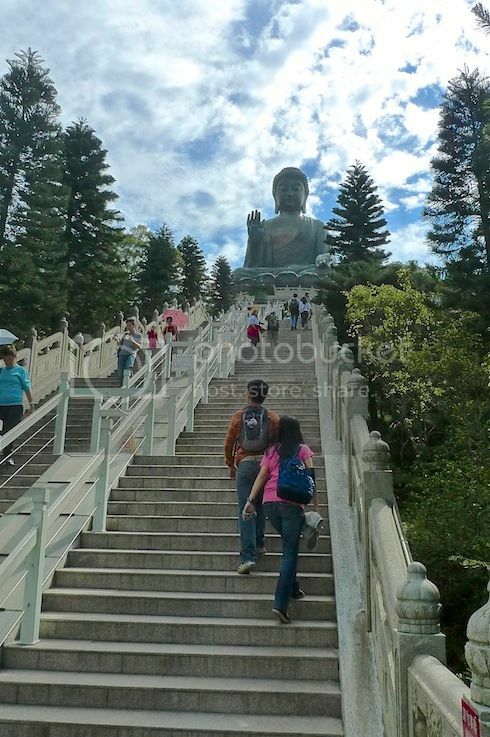 As I descended the stairs, I took one last look at the Big Buddha. 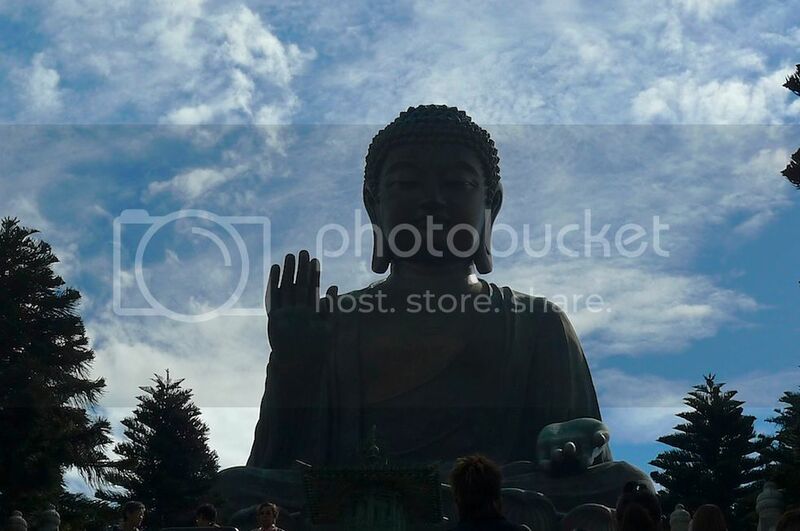 It looked as if the Big Buddha was bidding me a good farewell. 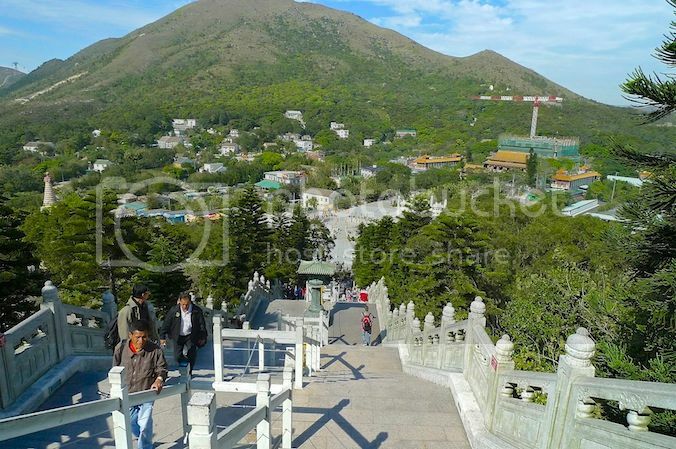 For more detailed information on the Tian Tan Buddha especially on how it was built, check out the Po Lin Monastery website.